Johnston Press is a UK-based publishing company, founded in Falkirk, Scotland, in 1767. It publishes over 250 regional newspapers in the UK and Ireland, including The Scotsman, The Yorkshire Post, and The Falkirk Herald. In 2016 it bought the i national newspaper. Highfield resigns from Johnston press citing family reasons. He will be replaced by chief financial officer David King. I have been privileged to lead Johnston Press during a period of unprecedented turbulence in our industry. Since 2011 we have grown our overall audience, in particular our digital business, created an industry leading telesales operation and maintained margins. The acquisition of the i newspaper has been a particular highlight. I am proud of what the board and my colleagues have achieved and would like to thank them all for their support. We are sorry that he felt that his personal circumstances required a change at this time. We wish him every success in the next phase of his career. Ashley oversaw the successful acquisition of the i newspaper, has driven growth in our digital footprint, while making substantial progress in reorganising and restructuring our business. We wish him every success in the next phase of his career. Despite an industry wide backdrop of significant downward pressure on revenues, the actions we have taken to pilot the business through this rapidly-changing market and create the conditions from which to create growth are starting to bear fruit: circulation figures of key titles are improving, the i has bucked the trend of declining national newspaper sales and our progressive editorial and sales models are starting to transform our regional businesses. While we can expect to see continued pressure on traditional print revenue streams, we have seen digital return to growth in Q1 2017, with better margin products, and will see growth from our investment in the i from both the newspaper and website. Further, we will start to see the benefits of our restructured sales teams and product roll out. We are delighted to win this new business on top of the Metro contract just recently won and this further confirms our printing services division as one of the best in the country. This latest long term contract will give the staff a real boost and their ability to deliver such prestigious titles against very tough competition is a great reflection on the business. Highfield got a huge bonus following the restructure of the business two years ago. But since that restructure shareholders have lost 90% of their money. The market continues to be challenging and uncertainty surrounding the outcome of the Brexit negotiations has caused further softness in some segments of the advertising market, in June and July. Nevertheless, we are focused on our strategy of increasing overall audiences, maximising opportunities for the i, maintaining tight cost control and rebalancing our portfolio. In that respect, we are nearing completion of the disposal of our Isle of Man newspaper group for £4.25 million and are well advanced in negotiations for further divestments. This disposal is further progress in executing our divestment strategy and allows the group to realise immediate value from our Isle of Man assets. I would like to thank the staff of our Isle of Man business for their loyalty and dedication over the years and we wish them well for a successful future. Buying a profitable local weekly set-up such as the Isle of Man trio is certainly a departure from our early days when, without much cash, we mostly bought papers that were in trouble, or we had to launch them ourselves. We are most grateful to Ashley Highfield and his colleagues for all their assistance in bringing about this agreement…Everyone at Tindle Newspapers, will make [the staff] all very welcome just as soon as we are able to do so. Following the completion of the i acquisition, we continue to explore the disposal of certain assets, with a view to deleveraging the balance sheet and further reducing financing costs. i is a highly regarded newspaper with a clear market position and a loyal readership. 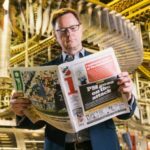 By joining with Johnston Press the combined circulation will be equal to 9 per cent of national daily circulation, making us the fourth largest player in the market. This enhanced reach represents a significant growth opportunity for Johnston Press in terms of national print and advertising revenue. It also rebalances our revenues towards less volatile circulation revenues. With our considerable digital experience the combination of Johnston Press and i will also allow us to grow digital audiences and revenues through the creation of inews.co.uk. Highfield talks about his plans to to take the regional newspaper group upmarket. The company will increase the number of ABC1 readers from 2.5 million to nearly 3 million with his acquisition of i. He says he won’t increase to cover price (the paper cost 40p and sells 270,000 copies/day). Two numbers keep sticking in my head. We have got 9 per cent of daily newspaper circulation and 3 per cent share of national advertising revenues in print. I think the pendulum will swing back to quality. Advertisers want quality audiences in print and online, and that is what we can deliver. Our strategy of moving ever-more upmarket has got to be the right one. Highfield also dismisses the suggestion that quality is suffering because of cuts to Johnston Press journalists. If you ask them ‘Do they produce better content than they’ve ever done?’, I’d hope they’d say yes. [Social media, reader-generated content and real-time analytics mean the editorial product has] probably never been of a higher quality. [But] the economics do not allow you to employ the same number of people as 20 or 30 years ago. Highfield says of the £24.4m acquisition of the i newspaper from Evgeny Lebedev. He intends to build the brand’s digital presence, increase the distribution of the print edition, targeting small- and medium-sized retailers like post offices and newsagents, and expand to all areas of the UK, including Northern Ireland, where the paper is not currently sold. He will improve editorial by taking 17 existing members of staff and hiring others to form a team of 50. The paper will also draw content from Lebedev’s The Independent’s website and the Evening Standard for £850,000 a year, as well as from Johnston Group’s regional papers. Highfield says that the purchase is about building scale for Johnston Press and attracting bigger advertising. He says scaling by acquiring small regional media groups would have taken a long time and been very expensive. We are in one quarter of the coun­try and we want to be in all of it, not least because this is a scale game and we wanted to go after more national advertising revenue and have a bigger train set across which to offer our digital services. I’ve always had a fundamental belief that video didn’t kill the radio star. New technology comes along, but it rarely wipes out what came before it. I think people will still want print for many years to come. This is a transformational acquisition for Johnston Press and an important step towards delivering our long-term strategy. i is a highly-regarded newspaper with a clear market position and a loyal readership. By joining with Johnston Press the combined circulation will be equal to 9% of national daily circulation, making us the fourth-largest player in the market. This enhanced reach represents a significant growth opportunity for Johnston Press in terms of national print and digital advertising revenue. It also rebalances our revenues towards less volatile circulation revenues. With our considerable digital experience the combination of Johnston Press and i will also allow us to grow digital audiences and revenues through the creation of inews.co.uk. People do not buy a local paper to turn to the small ads and sell a push bike. With that having migrated… you can argue it was a major missed opportunity for the regional press not to make more of those verticals like motoring or property… but that’s the past, and now we have a much more stable environment, and our audience numbers… have never been bigger. Highfield is interviewed by Douglas at Media Playground 2014 conference. They talk about the death of print, going mobile-first, the long-running spat between the regional press and the BBC and the future of local journalism. You need to get digital growing pretty rapidly to make up for print decline. We are getting to that digital tipping point. It is reported that Highfield earned more than £700,000 last year, his first full year at Johnston Press, His compensation comprised £400,000 salary, with bonuses and pension contributions of £301,000. At the MediaGuardian Changing Media Summit 2012, Highfield says he will not introduce a paywall at Johnston Press. He plans for Johnston Press’s 255 titles to derive 20% to 25% of advertising revenue from digital within three years. Currently 5% of total income comes from digital. The danger with content behind a paywall as News International did is that it is not indexed [on internet search engines such as Google], you then fall off the social graph and then no one cares what The Times says. It can be a spiral, a dangerous place to end up. Regional [newspapers] are about community, engaging with communities, and you have to be by and large free to do that. It is interesting but nothing we are about to follow soon. Highfield is also launching a combination of paid-for iPad apps and 140 free mobile phone apps, such as the Scotsman at £7.99/month, to drive revenue and readership for its regional papers. The mobile apps have added 2 million new unique users, boosting the publisher’s total digital audience to 10 million. Highfield also says that he can see new models such as “newspaper first to digital first” and perhaps by 2020, “digital daily, print weekly”. We need to make a digital transition, we need to do it and need to do it quickly. But this is not a panic situation. I don’t believe in a glide path to oblivion, but I’m not saying we don’t have to grasp the nettle. [Regional newspapers] are social, local and mobile but we just haven’t claimed that territory. It is going to be hard but there is survival. His combined online and media sector pedigree will be a major strength in enabling us to grow our business again. On behalf of the board I would also like to thank John for his major contribution to the company and wish him well for the future.